No longer are medications the sole ingredient of treatment for Bipolar Disorder. Learn about three bipolar-specific psychotherapies which have been shown to improve clients’ outcomes more than medications alone—and how to integrate them with your current psychotherapy approaches. Join author, expert and international speaker Dr. Leslie Lundt, MD, and learn about the latest findings, treatment, side effects, co-morbidity and psychosocial therapies for bipolar spectrum. You will take away proven strategies, techniques and tools to keep your clients on the road to wellness. 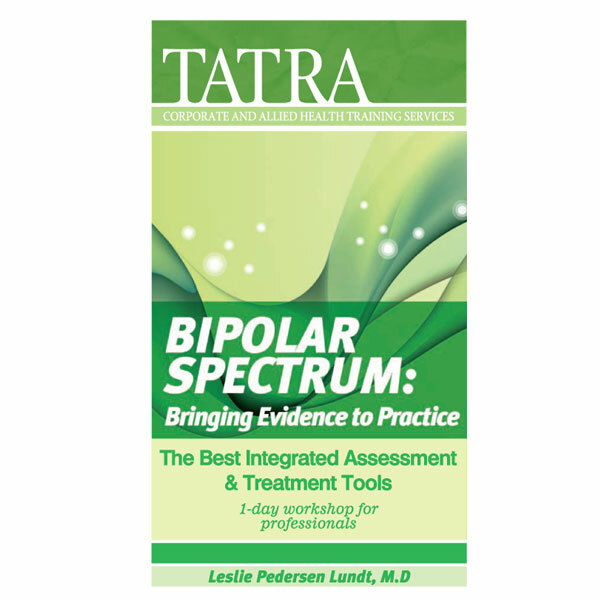 With the recent dramatic increase in the use of “bipolar disorder” as a diagnostic label, it is critical that mental health practitioners, counsellors and all clinicians understand how to identify clients with bipolar disorder and how to differentiate them from those with Uni-polar Depression, ADHD, anxiety disorders and borderline personality. No longer are medications the sole ingredient of treatment for Bipolar Disorder. Learn about three bipolar-specific psychotherapies which have been shown to improve clients’ outcomes more than medications alone—and how to integrate them with your current psychotherapy approaches. You will learn how to apply key components of empirically-tested psychotherapies to reduce relapse and improve functioning of bipolar clients. A simple way of organizing at least 11 “soft signs” of bipolar disorder to make your assessments rigorous and convincing will also be discussed. The changes in classification of Bipolar Spectrum Disorders in DSM-5, and how these changes will impact on your practice, will be explored in detail.